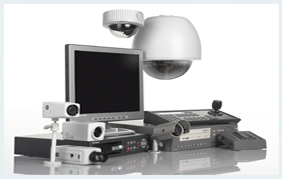 We are best CCTV suppliers in Oman. Our security cameras offer dependable remote surveillance functionality that satisfy your security needs completely. CCTV & surveillance systems is a system whereby we have a visual monitoring of different areas with add on sound features to get output on PC, TV or dedicated monitor. The visual display can also be recorded on time lapse VCR's and PC's, which serves as a proof for future analysis. These cctv video surveillance, video surveillance equipment are also employed with advanced motion detection algorithms for automatic detection and recording thus incorporating intrusion detection with surveillance.. It has the feature of recording and displaying any kind of incident under surveillance. It is completely monitored through control system .We offer these CCTV Surveillance Systems in Oman after complete quality and performance measures inspection. These are highly demanded in various small scale to large scale industries and organizations. We do complete installation of these Demo Systems at the client's end.